Are you ready to Work Your Light? This beautiful 44-card oracle deck has been created to help you light up the world with your presence. By working with its five suits and connecting with your intuition, you will be able to start living a life in alignment with who you truly are. - Confirmation cards give a quick hit of instant guidance. - Inquiry cards help you tune in to the whispers of your soul. - Action cards guide you on what action to take. - Activation cards invoke healing within you. 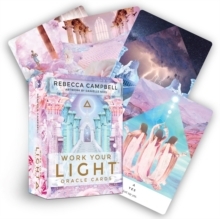 - Transmission cards connect you with supportive energies. The accompanying guidebook contains in-depth meanings for each of the 44 cards, and reveals how to attune your cards, activate soul space before starting work, create different card spreads, and give readings for other people. When you work with the cards you will find that your intuition increases, your soul's voice gets louder, and you are able to deeply embrace the work you came here to do.